In Santa Catarina da Fonte do Bispo, a village located in the interior of the Algarve (about 7 km from Tavira city) this is definitely a great hotel if you are looking for a relaxing holiday in contact with nature. Away from the big urban centers and crowded hotels, this is undoubtedly a great option for your holiday in the Algarve. The Hotel was build recently, inside a old farmhouse, with modern and spacious rooms. Here you can rest, participate in ecological activities and sport ( bike, walking or running ). We will be very happy to provide your transfer between the Hotel and Faro Airport. All transfers are private, direct between Hotel Rural Quinta Do Marco and Faro Airport with no other people on board or extra stops. One of our top picks in Tavira. 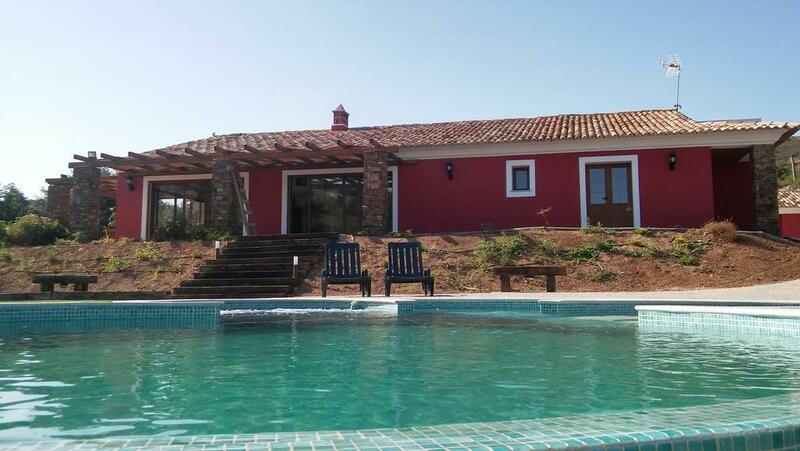 Hotel Rural Quinta do Marco is located in Santa Catarina da Fonte do Bispo by Algarve’s Caldeirão Ridge and offers far-reaching views of the Atlantic Ocean. The 18-hectare property is surrounded by green farmland, providing a unique sense of quietness. The recently renovated air-conditioned ample rooms offer a modern décor and are equipped with a TV and a private bathroom. The property comes with free WiFi. The on-site restaurant offers a rich local menu made with biological products from the property and provides panoramic views over the unique Algarve landscape. There are also various common areas for relaxation as well as an outdoor swimming pool for adults and children. Sun-covered areas allow guests to relax and perhaps read a book. The centre of Tavira is 6.8 miles from the Quinta do Marco and Faro International Airport is 20.5 miles away. The nearest golf course is 9.9 miles away and Tavira Island is 7.5 miles away reachable via boat. Sunline Transfers Faro Airport Transfers to Hotel Rural Quinta Do Marco rated 4.9 out of 5 based on 109 customer reviews on	Tripadvisor. Hotel Rural Quinta Do Marco is located in Santa Catarina da Fonte do Bispo at 35 km from Faro Airport, it will take around 45min to travel between Faro Airport and Hotel Rural Quinta Do Marco. Sunline Transfers were extremely professional, with great communication and prompt responses. The driver was awaiting our arrival and was very friendly and helpful. On the day of our departure, he arrived early at Hotel Rural Quinta Do Marco to collect us and again was very helpful, as we were travelling with two children. I soul highly recommend Sunline transfers.. I had the pleasure of using Sunline Transfers during a recent trip to Santa Catarina da Fonte do Bispo. The chat box on their website was extremely helpful however and the whole thing was arranged in a couple of minutes. This company is a pleasure to do business with and fairly priced. I would recommend to anybody going to Hotel Rural Quinta Do Marco and hope to use them next time I'm in the area..
We have a fleet of new, clean and comfortable vehicles, the perfect choice for a smooth journey to Hotel Rural Quinta Do Marco.